Here on Life with Lynnie (LwL), I want to wish my grandson, J... Happy Birthday! I pray you'll have a wonderful, special day; I'll look forward to seeing you! Happy Birthday! Now, I'll address an issue that truly touches my heart. It's regarding my mom's death. August 27th, was the anniversary of my mom's death. I must admit that I miss my mom. And, it's now 15 years since her life ended. 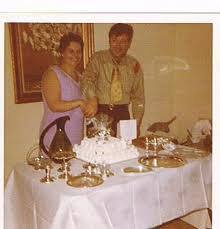 Here is a photo of my mom and dad, when we celebrated their 25th wedding anniversary, many years ago. It's possible that some people would say I am still feeling grief. It may be the case. But, it seems to happen not just with my mom, but also with other people who I've loved, who died. Just as I miss other people. I miss my deceased husband, my brother, my granddaughter and other relatives and friends. Only God knows, to be sure. I'm sometimes thinking it's grief, but sometimes just think that I miss those people I love. Even so, God knows that we will feel this way when someone we love, dies. Thinking about the loss we feel when someone we love dies, made me think of James 4:9, "Be afflicted, and mourn, and weep: let your laughter be turned to mourning, and your joy to heaviness." Yes, we can be afflicted. And, usually are. Just as we read in today's Bible verse, we need to let our laughter be turned into mourning and our joy into heaviness. This tells us that God truly knows how we will feel, and how we truly need to feel. Plus, He helps us... always. For this, I'm thankful. And, always will be.